Collaborative Chain Reaction at CJM — Wonderful Idea Co.
As part of our work with the Contemporary Jewish Museum around their Art of Rube Goldberg and Contraptions exhibitions, we hosted a collaborative chain reaction workshop with teachers and then with museum visitors at their Night at the Jewseum event. The workshop was in a brand new area in the front of the museum and Mario, Andrea and I were excited to set up the tables and materials for the inaugural workshop in the space. The teacher workshop gave us the chance to learn with local teachers interested in trying chain reaction related activities in their classrooms. There were about 16 educators who built some really wonderful contraptions. After spending about two hours building the machines, sharing the creations, setting off the chain reaction and reflecting on the process we cleared off the table and reset the space for the public event. Right away people came and starting building and experimenting with some really complex contraptions. The space was really activated and visitors were engaged working with friends and total strangers to create their Rube Goldberg inspired devices. The space was full as we set off the chain reaction. Here's a video of the machine in progress. Although the finale accidentally got triggered early, people were sure excited to watch each element of the machine. You could see that they were quite proud of what they built. We believe that tinkering is a important way to build understanding around a topic or content area. 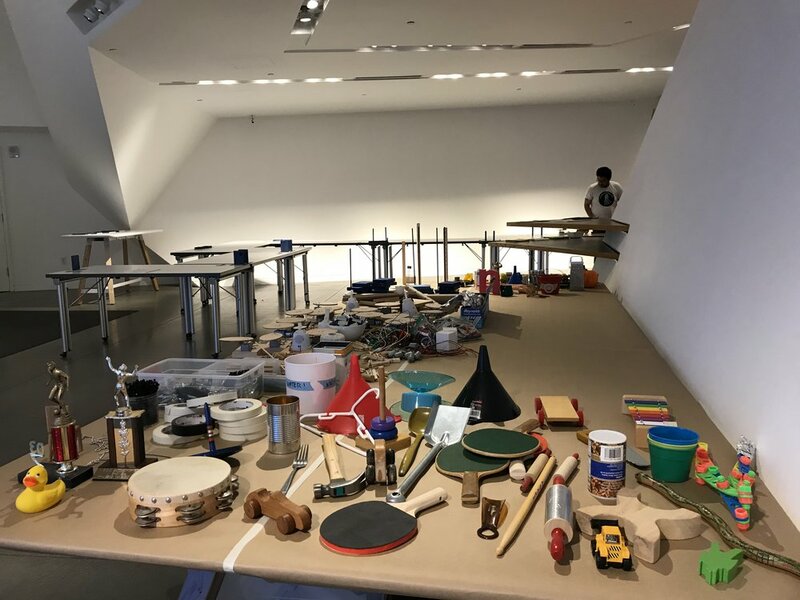 We felt fortunate to be able to lead this workshop in connection with the Rube Goldberg cartoons, Nicole's resettable example and working machines built by local artists. All together these experiences created really deep possibilities for understanding around chain reaction machines.